A beautiful wrap by Jennifer Dassau of The Knitting Vortex, this one is quite unique indeed. "An elongated, asymmetrical wrap that combines the warmth and style of a shawl with the wearability of a scarf. Sundry means various or diverse, and this wrap features two colors, two stitch patterns and endless styling options. "Cast on at the long, pointed end, Sundry is shaped at the ends of rows that grow ever wider. 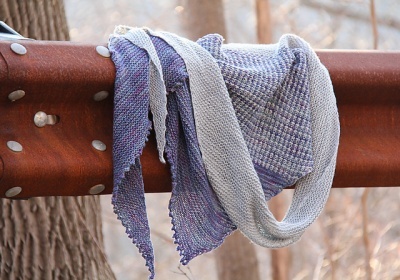 Two colors contrast yet harmonize in solid garter stitch and houndstooth slipstitch sections. The slipstitch is easily worked using just one color per row. A simple picot bind off finishes the long straight end." Jennifer rates the experience level needed to successfully make this lovely piece as Adventurous Beginner. The yarn she used in the ones you see here were String Theory Hand Dyed Yarn Selku (50% silk, 50% merino; 375 yards); 1 skein MC & 1 skein CC, shown in Pewter (MC) & Alexandrite (CC). 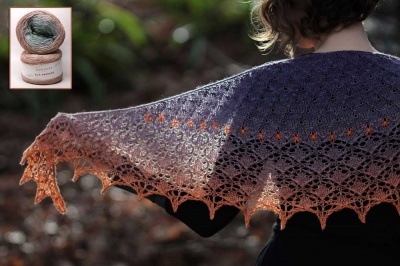 As written, this shawl uses almost every bit of yarn; Designer’s Notes include suggestions on adjusting for different yardage. 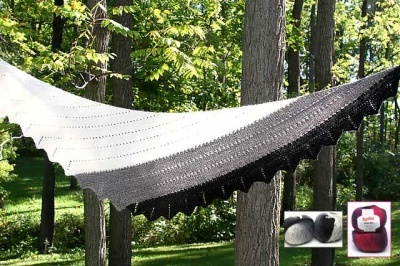 Basically figure on sport weight yarn, about 750 yards (that's 686 m) total to make a wrap that is 24" x 86" --- but bear in mind that this is customizable for any amount of yarn. That is one of the things I like best about Jennifer's patterns -- she puts control squarely in the knitter's hands. And (ahem!) 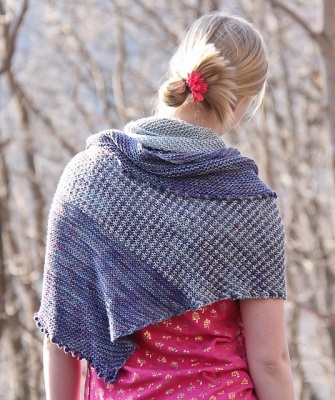 we just happened to get in some really lovely sport weight yarn -- that I think could work beautifully for this design.